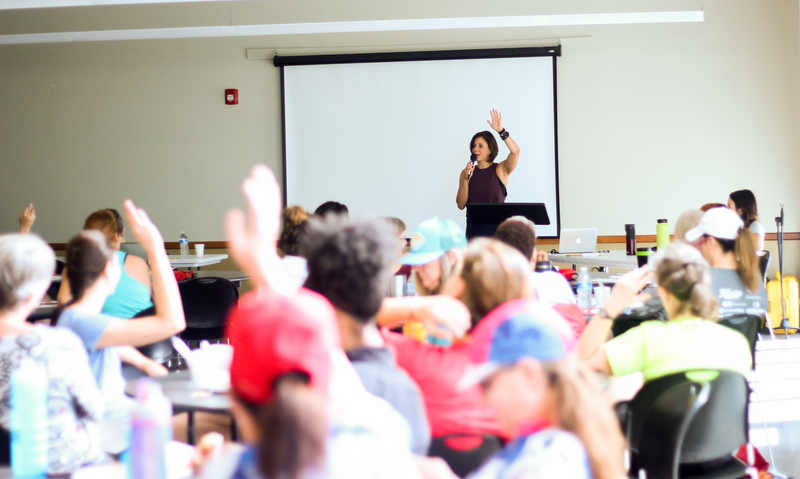 More than 140 women of all ages and skill levels gathered on Saturday, September 15th for the 4th Regional Women’s Bike Summit at the Southeast Community Center (in partnership with KC Parks & Rec). They arrived ready to learn, network, and get inspired to lead their communities toward healthy, active lifestyles. Sarah Buchanan, founder of INDULGE, reminded us to work together for good. Panelists and speakers brought their experience and passion for bicycling to the classroom. They shared real-life stories and advice as bike commuters, physical therapists, bike campers, parents, competitive athletes, ride leaders, and more! With sessions ranging from “Rules of the Road” to “Touring & Bike Camping” to “Riding into Retirement,” there was something for everyone. A luncheon keynote, “Leading from Within,” featured women in leadership from around the region, sharing their ideas on making change within one’s own community. This panel included KCMO councilwoman and mayoral candidate, Alissia Canady; City of Mission Assistant to the City Manager, Emily Randel; Director of UMKC’s Center for Neighborhoods, Dina Newman; KCK City Engineer, Lideana Laboy; and City of North Kansas City Community Development Director, Sara Copeland. Guests raved about how frankly and openly the panelists discussed their personal leadership journeys. We offered several engagement activities, including Bike & Bus with RideKC, morning stretches and Thai Massage with Leslie Ann Healing Arts, Bicycle Dialogues (think bike-focused StoryCorps), a “Nonprofit Village,” and a vendor area hosted by our sponsors. Our first-ever Nonprofit Village featured other women-serving nonprofit organizations from around the region. Participants included OneKC for Women, Girls on the Run, MOCSA, the American Heart Association, Women on the Rise, Transportation YOU, Shirley’s Kitchen Cabinet, Revolve, Earth Riders, and Synergy Services. really know how to turn! 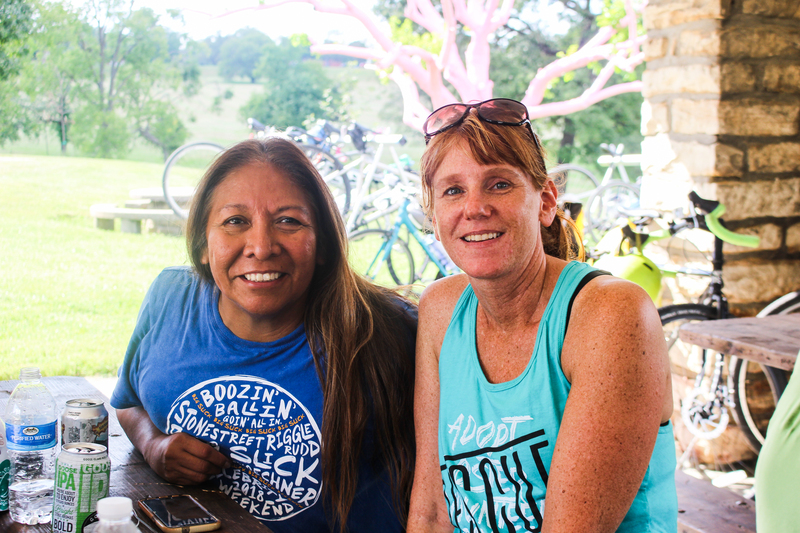 The ride leaders were so great, they were with me every step of the way.” When the riders returned, we greeted them with snacks and drinks at an informal Social Hour, a perfect setting to go deeper with new friends and plan new adventures. This Women’s Bike Summit was about bikes, of course, but it was also about women rising together. It was about women being leaders in their communities, whether that means joining a committee, organizing a ride, advocating for bike infrastructure, or teaching a neighbor how to fix a flat tire. It was about growing the network of women who ride bikes and create change, together. If you added up the giant grins, the lessons learned, the hearts overflowing, and the bicycles ridden, the Summit was a smash success. Find more pictures from the Summit on our Flickr. This “move-ment” doesn’t end with the Summit– it’s a year-round BikeWalkKC initiative! Find more information about how to support our efforts to get more women, trans, femme, and non-binary people on bikes on our Women Bike KC page.